Just took my wife and kiddo to the airport. Bachelor for the week. Flying to Washington with Ed to interview a potential Youth Pastor candidate. Taking a final (hopefully…if I pass) CLEP test to finish the units for my degree. Helping plan sermon series for the rest of the year. Training day for Royal Family Kid’s Camp. It’s a camp our church does for abused and neglected kids in the foster care program. I’m the camp pastor this year so I’ll be out all week long. No time for planning. Road trip south with David Thaw to Saddleback Worship Conference. So for those who were wondering, yes, I’m going. Hopefully we’ll be getting together with some old friends Sunday night. And if you’re in the area and wanna try and hook up for a lunch or somethin, hit me up please. A little gift arrived in the office for me today! 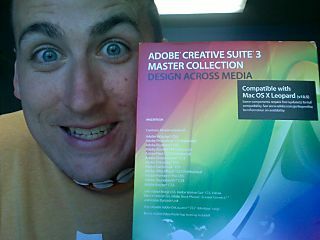 Adobe Creative Suite Master Collection!! Thanks a ton to our IT extraordinaire Michael Larson for the hook up on this baby! InDesign, Photoshop, Illustrator, Acrobat, Flash, Dreamweaver, Fireworks, Contribute, After Effects, Premiere Pro, Soundbooth, Encore. Don’t know how to use most of those programs well. In fact, a couple, I don’t even know yet what they do…yet. But I can’t wait to learn!! I’ll be makin some time for that! How’s your month shapin up? I was hoping maybe my brother-in-law would teach me After Effects. What I want to know is…what the heck are you doing reading and commenting on my blog during your honeymoon?! There’s gotta be better things to do than that! Can ya hook a broder up wit dat Massa Collection? Wow, looks like you have a lot on your plate. I’m looking forward to see Rachel and Caleb, but wish you were coming also. Have fun the next couple of weeks, it looks like you are swamped.